miR-361-5p is encoded by a gene located on chromosome X and has been implicated in several cancers. Decrease in miR-361-5p has been associated with increase in the malignancy grade in human cutaneous squamous cell carcinoma, prostate cancer and colorectal and gastric cancer. In hepatocellular carcinoma, miR-361-5p was down-regulated in comparison to adjacent normal tissues, due to hypermethylation at its promoter region. Overexpression of miR-361-5p inhibited proliferation and invasion of hepatocellular carcinoma cells. It was demonstrated that miR-361-5p was significantly decreased in glioma tissues and that overexpression of miR-361-5p inhibited glioma cell migration, invasion and epithelial-to-mesenchymal transition. 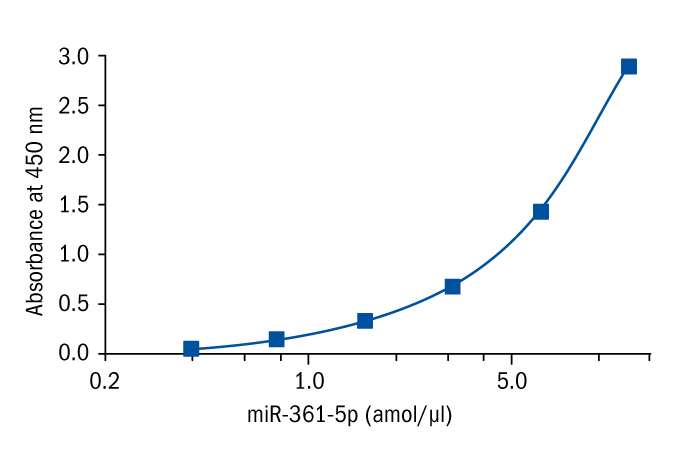 MiR-361-5p also suppresses lung cancer progression and decreases glycolytic metabolism, proliferation, and invasion of breast cancer cell. These results confirm a tumor-suppressive role of miR-361-5p in cancer cells. In contrast, miR-361-5p has been shown to act as an oncogene in cervical cancer. Besides cancer, miR-361-5p was reported to be related to Late-onset hypogonadism (LOH) and acute myocardial infarction. In LOH patients, there was a positive association between the plasma level of miR-361-5p and serum testosterone concentration. A recent study demonstrated that plasma levels of miR-361-5p together with miR-21-5p were markedly increased in patients with acute myocardial infarction compared to healthy controls, whereas the concentration of circulating miR-519e-5p was reduced. Furthermore, cell experiments demonstrated that these plasma miRNAs may originate from injured cardiomyocytes induced by hypoxia. In addition, the levels of all the three circulating miRNAs in ischemic stroke (IS) and pulmonary embolism (PE) were elevated. Han, Jianjun, et al. "Overexpression of miR-361-5p in triple-negative breast cancer (TNBC) inhibits migration and invasion by targeting RQCD1 and inhibiting the EGFR/PI3K/Akt pathway." Bosnian Journal of Basic Medical Sciences 19.1 (2019): 52. Kanitz, Alexander, et al. "The expression levels of microRNA-361-5p and its target VEGFA are inversely correlated in human cutaneous squamous cell carcinoma." PLoS One 7.11 (2012): e49568. Liu, Dachuang, et al. "MiR-361-5p acts as a tumor suppressor in prostate cancer by targeting signal transducer and activator of transcription-6 (STAT6)." Biochemical and biophysical research communications 445.1 (2014): 151-156. Ma, Fei, et al. "MiR-361-5p inhibits colorectal and gastric cancer growth and metastasis by targeting staphylococcal nuclease domain containing-1." Oncotarget 6.19 (2015): 17404. Sun, Jian-Jun, Guo-Yong Chen, and Zhan-Tao Xie. "MicroRNA-361-5p inhibits cancer cell growth by targeting CXCR6 in hepatocellular carcinoma." Cellular Physiology and Biochemistry38.2 (2016): 777-785. Zhang, Xi, et al. "MicroRNA-361-5p inhibits epithelial-to-mesenchymal transition of glioma cells through targeting Twist1." Oncology reports 37.3 (2017): 1849-1856. Hou, X. W., et al. "miR-361-5p suppresses lung cancer cell lines progression by targeting FOXM1." Neoplasma 64.4 (2017): 526-534. Ma, Fei, et al. "MiR-361-5p inhibits glycolytic metabolism, proliferation and invasion of breast cancer by targeting FGFR1 and MMP-1." Journal of Experimental & Clinical Cancer Research 36.1 (2017): 158. Wu, Xiaomei, et al. "MicroRNA-361-5p facilitates cervical cancer progression through mediation of epithelial-to-mesenchymal transition." Medical Oncology 30.4 (2013): 751. Chen, Yao-ping, et al. "The plasma miR-125a, miR-361 and miR-133a are promising novel biomarkers for Late-Onset Hypogonadism." Scientific reports 6 (2016): 23531. Wang, Feng, et al. "Atherosclerosis-related circulating miRNAs as novel and sensitive predictors for acute myocardial infarction." PLoS One 9.9 (2014): e105734.